Action return to Nigeria topflight football as the most successful team in the land, Enyimba, take a short trip to Nnewi for a date will Oriental brothers, the Warriors: FC Ifeanyi Ubah. League leaders, Plateau United, are also in Lokoja for a tricky tie with Niger Tornadoes who have made the Confluence Stadium a fortress where they make up for their ineffectual performances on the road. Kennedy Boboye’s men need to make a profound statement on their title chase by picking points away. This game against Niger Tornadoes is another opportunity for the Jos landlords to squeeze in points. After experiencing a shock defeat in Jos, the Promise Keepers rush back to Uyo to welcome Gombe United. Akwa United are still within reach for title glory and they can keep the hope alive by taking care of all hope games and wins some on the road. Gombe United will pose no real threat to a compact squad put together by former Mathematics teacher, Abdul Maikaba. Rivers United still in search for the Holy Grail – an away victory – will be guest of ABS FC. They take their first trip in the domestic scene after the reality of continental exit dawned on them. Stanly Eguma will lead the Pride of Rivers to this delicate tie hoping that, at least, their place in the NPFL is secured. 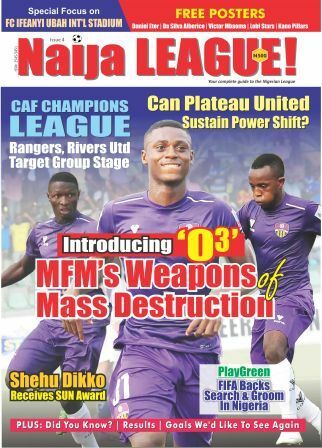 MFM FC will take on Wikki Tourists of Bauchi at the Agege Stadium, Lagos. The Tourists have been on a steady rise picking just one point of the road so far, in Nnewi that was. Their sojourn to Lagos will be a cracker as Fidelis Ilechukwu seems to have his eye on the title, thus one would think games in front of his home crowd is inviolable. Nomadic Ladan Bosso will welcome his former employers. When he led his lads to Umahia in the reverse fixture, they came home with maximum point in their kitty. One will not rule out the possibility of a double over Abia Warriors, put into consideration how unfavourable Maiduguri has been to visiting teams. In the Pyramid City, Kano Pillars will be on hand to impress their fans who have been allowed to see league games after the closed door ban was lifted by the league organizers. Rangers, their opponent will come into the game hoping to replicate what happened in Maiduguri where they picked an unimaginable point. Sunshine Stars host Nasarawa United while Shooting Stars are at home against Katsina United. Lobi Stars are expecting Remo Stars in Makurdi. The later are still fixed at the basement of the table. It is no doubt that Enyimba has done great exploits in the country before the emergence of FC Ifeanyi Ubah, but the Nnewi side is growing into a tough opponents in all ramifications. Though, Enyimba beats them in the head-to-head analysis, games between these two clubs always gather weight. Its an Oriental Derby and the stakes are high, seeing that both sides chances of coming close to the league trophy or getting a spot in the continent is much still feasible.